From its humble beginnings as the ubiquitous service vehicle in WWII, Jeep has become a part of the American psyche. It proved itself to be capable, reliable and solid throughout Europe and across the Pacific, and when the war was over, civilians snapped them up like hotcakes. Since 1947 it has grown in size and complexity, evolving from the world's first SUV into a line of remarkable vehicles that culminates in the Grand Wagoneer SRT8, a $60,000 marvel that is a serious challenge to its pricey Europen competitors. Those who own one just won't settle for anything less. 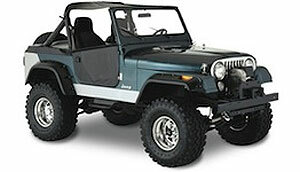 We've been repairing Jeep transmissions ever since 1965. At A1 Transmission Service Center, we know how much you love your Jeep. WWII service vehicle or modern SUV with every luxury appointment, we know exactly which parts need to be adjusted and which ones have to be replaced. Hands-on experience and having the latest diagnostic tools is a combination that can't be beaten. We know what it takes to get the job done right and bring your transmission back to health. No matter which Jeep you own, bring it to our shop and we'll diagnose the issue properly and have you out the door at a price that'll be kind to your bank account!